Oak Park, MI – As I travel Oakland County in search of news, I also like to let my taste buds explore. 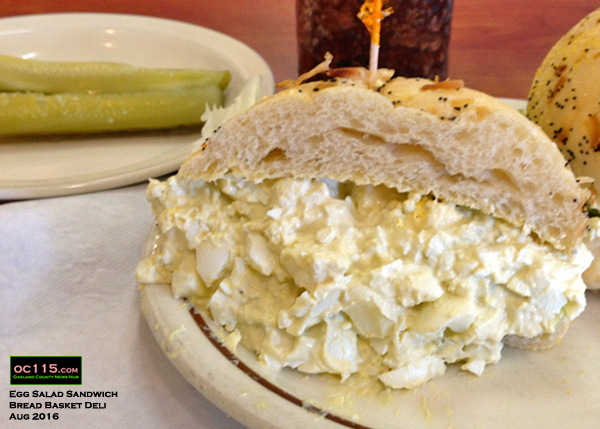 Recently I had a craving for an egg salad sandwich, so I asked oc115 readers on Facebook where in Oakland County I might find a delicious one. This was my first visit, but the menu was so intriguing I will undoubtedly be back. I was surprised to see that the egg salad sandwich cost more than some other meaty items, but when the waitress brought it to the table I could see why. It was huge. And it was, hands down, the best egg salad sandwich I’ve had in my life. Turns out it is a house specialty that is made fresh to order. As far as egg salad goes, it seems pretty simple: more creamy than mustardy or vinegary, and without “the crunchy stuff” like celery or onion. The real difference, I think, is the freshness. So if you are ever in the mood for a good egg salad sandwich, now you know where to get one. Breadbasket Deli is located at Lincoln Shopping Center, 26052 Greenfield Rd, Oak Park, MI 48237.